Pumpkin is considered as a superfood as it boosts vision, helps to give a healthy heart. So it should be included in diet. Pumpkin puri is an Indian snack or breakfast recipe which is delicious and super soft. 1. Knead dough using all the ingredients. Add 1 tsp oil in dough to keep it soft. Roll the dough in small balls. 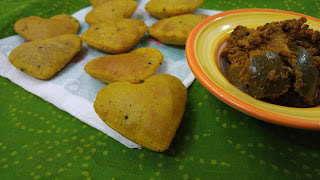 Roll the puri and using a heart molds, cut heart puris. Deep fry these pumpkin puris and serve hot with mango pickle and curd.